Last week we discussed the two different ways for a medical device to be reclassified at FDA. This week we’re going to dive in and give you an example of a recent medical device that underwent reclassification. On September 26th, FDA published a final order titled “Obstetrical and Gynecological Devices; Reclassification of Single-Use Female Condom, To Be Renamed Single-Use Internal Condom.” As you can tell by the name of the order, the device has been renamed from a “single-use female condom” to a “single-use internal condom,” effective October 29, 2018. In addition to the renaming of the device— which was done to differentiate it from the single-use internal condom— another change has been made to the device; it has been changed from a class III device to a class II device. This classification and name change comes as a result of newly evaluated information that was not available at the time of the original device’s premarket approval, as well as comments from the public that were received in response to FDA’s proposal to reclassify that came in December 4th, 2017. There were a total of 78 public comments in response to the proposed order from December 2017. The majority of these comments were in support of the reclassification of the device, as well as the name change and the effort to increase patient access to single-use internal condoms. As previously stated, the device was originally classified as a class III device. Devices that weren’t in commercial distribution before May 28, 1976 were automatically classified as a class III device without any FDA rulemaking, and are traditionally called postamendment devices. Those devices maintain that classification until the device is reclassified. One of the ways this reclassification can occur is if the FDA issues an order that finds the device to be substantially equivalent to a predicate device that does not require premarket approval. FDA can reclassify devices on their own initiative, or in response to petition from manufacturer or importer of the device. FDA relies on valid scientific evidence in the classification process to determine the level of regulation for devices. The final order highlights that when used correctly, the single-use internal condom is the only female-controlled method that is intended to prevent both pregnancy and the transmission of sexually transmitted infections (STIs). By finalizing this reclassification, the FDA minimizes the regulatory burden on industry, since single-use internal condoms will no longer require premarket approval (PMA). Instead, these devices will require a less burdensome 510(k) prior to marketing. 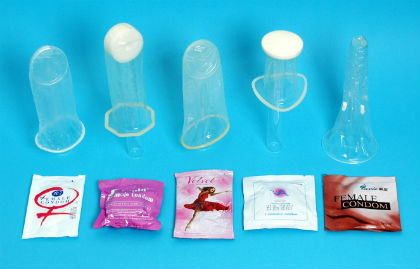 The single-use internal condoms have been reclassified to class II with special controls under 21 CFR part 884 for obstetrical and gynecological devices.The special controls established for this device are clinical performance testing, viral penetration testing, nonclinical performance testing, biocompatibility analysis, shelf-life and packaging testing, and labeling. Each of these special controls contains further details and requirements. For example, the clinical performance testing must include the rate of clinical failure, rate of individual failure modes, and the cumulative pregnancy rate when using the device based on a contraceptive effectiveness study. Viral penetration testing is required to demonstrate that the device is an effective barrier to STI’s, and the shelf-life and packaging testing is necessary to demonstrate that the device maintains the performance characteristics and integrity for the duration of the shelf-life. In addition, the nonclinical testing must include both mechanical testing and compatibility testing. That’s a lot, right? But it’s all for a good reason! Reviewers need to make sure that the reclassification is valid, and is being reclassified into the right class.